LOCALLY OWNED & OPERATED SINCE 1998! t’s so nice that spring has come and we’re closer to summer break! We hope that you enjoyed our Education issue in February and we’re excited to share our annual Health issue with you now. We enjoy finding articles to share with our readers that we think you’ll find interesting. If there’s ever a topic you’re interested in sharing with our readers or a topic that you’d like us to write about, please let me know! 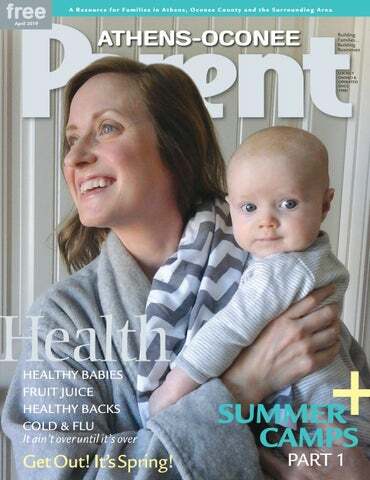 In this issue, Liz Conroy shares how we can help teens protect their backs, our own Dr. Jonathan Robinson has great advice for the parents that read AOPM, and local physician Dr. John Norris chimes in on breastfeeding. We get suggestions from dermatologist Dr. Jocelyn Lieb about scars and Dr. Chad Larson has tips for us to continue avoiding the flu. I’m excited that we can share Part 1 of our Summer Camps guide with you in this issue as well! Part 2 of our camps guide will be coming out in our May/June issue – Summer Camps and Family Fun. Stay healthy! Read Athens-Oconee Parent Magazine anywhere, any time ... online! Visit athensparent.com and click “read online.” Also, check out our online calendar for up-to-date, family-friendly events. The Very Hungry Caterpillar by Eric Carle has been crawling its way into kids’ hearts for 50 years, and what better way to celebrate than by giving him a brand new cocoon! With a beautiful golden anniversary jacket, along with a new introduction from Eric Carle himself, this anniversary edition will be sure to delight Caterpillar fans of all ages. Bonus content features an appreciation by prominent children’s literacy advocate Dolly Parton, as well as an essay on the history and significance of the Caterpillar, including rare images of the original sketches and historic photos. Visit us on Facebook for a chance to win a copy of The Very Hungry Caterpillar 50th Anniversary Edition! Celebrate the 50th anniversary of The Very Hungry Caterpillar and make an edible caterpillar snack! You could do this with fruit or veggies. For our caterpillar, we used a strawberry and pieces of green apple for the face. For the body, we used green apple, pear, and kiwi slices, but you could use green grapes, cucumber or zucchini! His legs, feet and nose are made out of raisins. Make your caterpillar on a tray or platter and serve with yogurt for dipping. Thanks to kitchenfunwithmy3sons.com for this fun idea! on’t let runny noses and scratchy throats slow your little ones down. Propolis Throat Spray for Kids, with antioxidantrich buckwheat honey and propolis, is a gentle, kid-friendly duo that’s naturally tough on germs, but also super soothing on scratchy throats. Many more superfoods from the hive are available at beekeepers naturals.com. hermal-Aid stuffed animals are made for kids to make their parent’s life easier. With a cuddly animal acting as a heating/cooling pack, a child will feel comforted rather than intimidated. The Thermal-Aid animals are 100% natural cotton on the outside and the inside is made of specifically engineered corn, eliminating any potential odor or mold that most natural therapeutic packs get, plus they are washable, allowing repeated use. Troy Tastes... ON THE BOOKSHELF In Fish Are Not Afraid of Doctors by J.E. Morris, Maud gets nervous waiting at the doctor’s office for a checkup, so she looks to the fish tank in the waiting room for comfort. Fish don’t have to go to the doctor – she wishes she could be a fish. So when Maud has to get a shot, she shuts her eyes and pretends exactly that: She becomes an aquatic version of herself and pretends to swim through the sea, blowing bubbles and meeting other marine life, until she hears the doctor telling her it’s all done! I Love Big by Kat Kronenberg has a beautiful message that makes it a wonderful gift for those who want to build a loving WE community – from home to school, neighborhoods, church, or travel. If people can begin to encourage one another to pursue their passions – with kindness, sharing, listening, and care – we can overcome anything and achieve extraordinary dreams together. r. Christopher Doerr (CD), a Rehabilitation Specialist who runs Physicians Back and Neck Clinic Athens Physical Therapy, agrees about the importance of careful lifting and appropriate exercise for back care. Doerr seeks ways to heal patients through exercise whenever possible. He answered these questions about back care in an interview with Athens-Oconee Parent Magazine (APM). APM: Back pain seems increasingly common in the U.S. What are some reasons for back problems? Teens practice the “plank” which strengthens the abdominal muscles amd helps keep the back straight. The only way to know if breastfeeding is right for you and your baby is to try. sition of human milk changes over time as the growing infant’s nutritional needs change. The composition of breastmilk changes from the beginning of a single feed to the end; from the beginning of the first week of life to the end; and from the first month of life to the seventh, etc. Second, breastmilk plays an important role in providing immune protection at a time when the baby’s own immune system is still immature. During this vulnerable period, human milk provides the infant with maternal disease-fighting antibodies, as well as with a host of other anti-microbial chemicals and immune system regulators. Third, among its many components are specific sugars, growth factors and regulators that contribute to the normal development of the gastrointestinal tract and the central nervous system. Finally, it sets the table for a more open-minded approach to complementary (solid) foods. Scientists believe that the different foods in a mother’s diet lead to variations in the flavor of her breastmilk. Thus, when solid foods are added to the infant diet at around 6 months of age, breastfeeding babies are more accepting, as they have already been sampling these different tastes via the mother’s milk, whereas formula fed babies have experienced only formula and often object to the new tastes offered by cereals, fruits and vegetables. Currently, the AAP recommends exclusive breastfeeding for about 6 months. Following the addition of complementary (solid) foods at about six months of age, they recommend continued breastfeeding until the first birthday or longer, as mutually desired by mother and infant. Similar recommendations are endorsed by the Institute of Medicine, the Academy of Breastfeeding Medicine, and the World Health Organization (WHO). Unfortunately, in the US, only 22 % of mothers meet this goal! Many of these failures result from a lack of understanding of the many significant health benefits of breastmilk, coupled with an incorrect perception that formula somehow represents “the standard” feeding method. Even worse, many of the mothers and families that could benefit most from the low cost, convenience and protective health benefits of breastfeeding – teen mothers and families with limited resources – are the most likely to hold incorrect views of its importance. Dr. John Norris MD, Ph.D, is a board certified pediatrician, an assistant clinical professor at the UGA/AU Medical Partnership, and the father of three formerly breastfed children. their use by breastfeeding mothers may lead to problems with the infant’s longterm development and behavior, and is not recommended. In summary, breastfeeding is a free, convenient, natural way to feed your full-term baby (nutrition in preemies may include additional considerations). In addition to providing optimal nutrition, breastfeeding promotes mother-infant bonding, offers partial protection against a variety of maternal diseases, and provides increased protections for the infant to infectious diseases, SIDS, gastroesophageal reflux (GER), leukemia, diabetes and obesity. In those rare instances, such as an infant with metabolic disease, a mother with a history of breast surgery, a mother requiring certain medications, or with a history of some systemic illnesses, that make breastfeeding either dangerous or impossible, modern artificial milk (i.e, infant formulas) provides a safe and acceptable alternative for feeding an infant. Except for meeting a baby’s basic nutritional needs under these special circumstances, formula provides NO additional nutritional or health advantages. For everyone else, “breast is best”! • decreased postpartum blood loss and more rapid involution of the uterus • increased child spacing • decreased risk of post-partum depression • decreased risk of ovarian cancer • decreased risk of breast cancer • decreased risk of rheumatoid arthritis • with prolonged breastfeeding (greater than or equal to 1 year) women have a decreased risk of high blood pressure, hyperlipidemia, cardiovascular disease, and diabetes. FRUIT JUICE OFFERS NO nutritional benefit to children under age 1 and should not be included in their diet, according to a new policy statement issued by the American Academy of Pediatrics that marks the Academy’s first change in recommendations on fruit juice since 2001. Over past years, the Academy advised against offering fruit juice to children under the age of 6 months, but has expanded that time frame to include the entire first year of life. The statement, “Fruit Juice in Infants, Children, and Adolescents: Current Recommendations,” was published in Pediatrics and accounts for the rising rates of obesity and concerns about dental health based on evidence accumulated over recent years. [It’s Not For Babies] The American Academy of Pediatrics recommends no fruit juice for children under 1 year old. Fresh fruit is preferable for older children because it provides dietary fiber and less sugar than juice. Portion control is key when serving fruit juice to older children. Use a measuring cup to learn how much a 4-, 6-, or 8-ounce serving really is. ntake of juice should be limited to, at most, 4 ounces daily for toddlers age 1-3. For children age 4-6, fruit juice should be restricted to 4 to 6 ounces daily; and for children ages 7-18, juice intake should be limited to 8 ounces or 1 cup of the recommended 2 to 2 1/2 cups of fruit servings per day. By Jonathan C. Robinson, Ph.D.
thoroughly. Then, ask him where he sees himself pitching in and helping out? Don’t give up your role as primary caregiver, but encourage him to co-parent with you when you are both at home. Sharing the load cuts the work in half. Consider him a “junior partner,” where you oversee his efforts and bring him along in this parenting journey. Finally, when you both are on the same page, call a family meeting to let the kids in on the experiment. Write down the weekend and evening routines, so all know exactly what is happening and who’s in charge. As your kids get older, they can do more on their own, but always with parental oversight. Take a week or two to try it all out, tweak the system as you need to, ask for feedback from everybody. Then, put it into effect with a check-in meeting on Sunday afternoons to debrief on how last week went and plan for the coming week. I know this all sounds like a lot. Both you and Al will feel more appreciated, working together, and you are presenting a great role model for your kids. Happy parenting. time was up. Not much impact. The point of punishment is not to hurt the child. Hopefully it is to make such an impression on him that he gets it and doesn’t do the wrong behavior again. The best way to make that point is to involve your child in the process from the start. Also, remember that “punishment” will only likely have a short-term effect. Go for “natural consequence.” With that goal, your child personalizes the process and, hopefully, sees how his behavior effected his actions. The best natural consequences lead to teachable moments. Joey hits his younger sister, Sally. Mom sees it all. “Go to your room, young man, and no electronics for a week.” Joey complies, but learns nothing. This punishment might fit the crime, but at the cost of Joey’s relationship with his parents and with his sister. After all, Sally “caused” Joey to hit her. “Go to your room, young man, and think about how we can fix this so it doesn’t happen again. I’ll be in there after I get your sister settled.” When you get back to your son, active listen his protests and rationale for his behavior. When he’s settled enough to be able to hear you, ask how he could have handled the situation differently. Now he has options, rather than impulses. Then tell him, as his “natural consequence”, he needs to write his sister a letter of apology, spend at least 30 minutes a day for the next week hanging out with her to understand what makes her tick, and then talk to you after the week to let you know what he found out. Will it work every time? Probably not, but it’s a step in the right direction. Hang in there. n Dr. Robinson is a licensed, clinical psychologist. His specialty is in school-clinical, child psychology, with emphasis on child development, parenting and family counseling. He is also author of Teachable Moments: Building Blocks of Christian Parenting, now available nationwide in bookstores and on-line as an e-book. Activities and free play will fill every part of this much-anticipated destination which is loaded with learning adventures relating Georgia’s natural history and resources. Be ready to get your hands dirty, enjoy community and learn about what makes our state so unique by beginning your Garden Earth Explorers passport in this new playscape! Free. 9am-4pm. Enjoy a full delicious brunch buffet with the bunny. Children’s tickets include a visit and photo with the Easter Bunny (including a complimentary digital copy), a stop by the bunny petting zoo, an exciting Easter egg hunt for fun prizes, an Easter themed crafting station and more. 10am-12pm at The Classic Center. Tickets $25 adult, $20 children over 1 year, children 1 year and under free. Visit classiccenter.com. Join us for a day of festival fun on our campus! Inflatables, climbing wall, dunking booth, games, face painting, prizes, and more! Tickets and wristbands can be purchased at the door and concessions and lunch food will be available for purchase. Festival will take place at the baseball complex, located just inside the gates on Highway 441. Caterpillar and His Cool Cool Car! The Very Hungry Caterpillar is celebrating his 50th Anniversary by traveling around the country in his Cool Car! Although he may be 50, the Caterpillar still wants to meet all of his fans young and old. Check out his groovy vehicle, meet the caterpillar himself, make colored paper collage art, and experience his classic story. Books will be available for sale. All ages. Some events, dates and times are subject to change. Please call individual event organizers to confirm schedules. All area codes are 706 unless otherwise noted. Dr. Chad Larson, NMD, DC, CCN, CSCS, is a Certified Clinical Nutritionist and a Certified Strength and Conditioning Specialist. He particularly pursues advanced developments in the fields of endocrinology, orthopedics, sports medicine and environmentally-induced chronic disease. AVOID harmful supplements While there are many supplements that can aid in strengthening a compromised immune system, there are also herbs and other supplements that can aggravate an already-overactive immune system. The enhancement of immune response can be counterproductive in people with autoimmune disease, therefore certain supplements should only be taken under the guidance of a qualified practitioner. One herb to be aware of is Echinacea, a botanical supplement used to boost the immune system, as it may cause added flare-ups in an already hyperactive immune system. Garlic is another, as three substances in it – allicin, ajoene, and thiosulfinates – potentially rev up your immune system by increasing the activity of white blood cells. It is suggested to check with your naturopathic physician about other supplements to avoid for specific autoimmune diseases. A SCAR IS AN unavoidable result of incision or injury to the skin. Unsightly as it may be, a scar is a near-miraculous example of the body’s ability to heal itself. The appearance of a scar is dependent on many factors - the size and depth of the wound as well as the individual’s age, genes, and skin pigmentation. “Many scars fade to near invisibility on their own over a period of months,” says Dr. Jocelyn Lieb of Advanced Dermatology, P.C. “But some disfiguring scars do not fade and cause emotional and physical discomfort long after the initial wound has healed. Fortunately, we can take steps to reduce the severity of a scar and, although we can’t always remove it entirely, we have a range of treatments that can minimize the scar and make it more consistent with surrounding skin.” A scar forms when there has been damage to the deep, thick layer of skin called the dermis. As the skin heals, the new collagen fibers that replace the damaged tissue have a different protein composition than the original tissue, which causes the new skin to have a different texture and appearance than surrounding skin. There are different types of scars: Most are flat and pale. When too much collagen is produced, the scar may be red and raised (hypertrophic) and if the raised scar extends beyond the boundaries of the original wound, it is known as a keloid scar. Contracture scars result from burns; as they tighten, they can restrict movement and may affect underlying muscles and nerves. Cystic acne and chickenpox scars are often pitted or indented (atrophic). Jocelyn Ann Lieb, M.D. F.A.A.D., is board certified in dermatology and is a member of the New York Academy of Medicine, the American Medical Association and the American Academy of Dermatology. Sum Camps! Consider these great camps that Athens and Oconee County â&#x20AC;&#x201C; and throughout Georgia â&#x20AC;&#x201C; have to offer children of all ages during the summer! We have tried to iclude the important information for each camp. However, due to changes that may have occured after press time, please call individual camps or visit their web sites for the most up-to-date details. online at www.oconeecounty. com/ocprd beginning Monday, April 15 at 8:oo a.m.
• Moana’s Ballet Camp: July 15th –17th (Mon-Wed) from 9:30-11:00am POP JAZZ DANCE CAMP • For ages 5-8 • July 22nd-25th (Monday -Thursday) from 9:30-11:30am • $80 (includes snack and craft materials) Come join us for pop jazz class, crafts, and a mini-performance on the last day! of day camp to robotics, fine arts, sports camps, coding camps, enrichment classes, and much, much more! Anyone can participate in Summer at Athens Academy--no matter what school you go to! New this year are offerings like Dungeons & Dragons, Games Galore!, Art Camp for Middle Schoolers, plus several others. Check the website often because new camps are added every week! New Moon Summer Adventure Camp 706-310-0013 Travel to different locations throughout Georgia and South Carolina. Activities include hiking, swimming, boating, ropes course, trips to museums, farms, zoos and much more! Ages 6-12. $175 per week covers all activity and travel expenses. Operating weeks of June 3rd-7th, and 10th-14th; and July 8th-12th and 15th-19th. ; from 8:30am5pm. Contact Cindy Jones at 706-310-0013 to register. At ARTeeniess ARTcamp your child will not only get to explore their creative side, but they’ll learn terminology & technique, as well. Your children will have a great time and take away from ARTcamp artwork they created, fun memories & art knowledge. We’ll be doing canvas painting, wood crafts, ceramic painting, and polymer clay. • Ages 7 & up. • $175 per child per week. • $150 for each additional child per week. games, card games and reading. The last part of the day, campers will spend time developing their own games! Kids can develop a new board game, outdoor game, carnival game or party game. Whatever campers think would be fun to develop, we will help them do it! And, of course, they can take their game home at the end of the week! • JULY 1-5 (no camp July 4): Chocolate-making with Amanda Crouse We will learn to hand temper and make chocolates by working with various couverture chocolates. We will sample chocolates from various regions and learn about farming practices and climates in these regions. We will experiment with various techniques such as molding, dipping, making centers, ganache, fondant, cookies, and creams. We will learn to steep creams and make essence and extracts as well. • JULY 8-12: Music and Movement Camp with Natalie Smith Music and Movement Camp will be an exciting week of learning and playing music, moving creatively and practicing yoga. Campers will learn through instruction and through experience the basics of rhythm, musical notation, music theory and harmony, using all that they’ve learned to create their very own pieces of music by the end of the week. There will be a recital of their pieces at the end of the day on Friday. • JULY 15-19: Harry Potter Camp with Heather Hogan We’ll be teaching muggles how to be wizards! House sorting ceremony on the first day, along with Defense Against the Dark Arts, Potions, Herbology, and Care of Magical Creatures classes. Come dressed as your favorite character everyday or wear your Harry Potter inspired clothing. • JULY 22-26: Pastry and Needlecraft with Ashley Dunn Ashley combines her experience as a pastry chef and working in a Montessori classroom to lead children in a multitude of crafty and baking endeavors. • JULY 29-AUG. 1: KPop & art with Nara Kim & Ellen Klinger Nara Kim leads Double Helix’s afterschool art club while pursuing her doctorate in UGA’s School of Art. Ellen Klinger a Masters in Art Education. This camp highlights the cultural and artistic context of highly popular KPop bands while engaging campers’ artistic interests! Camp Southern Ground 678-561-9600 scott@campsouthernground.org southerngroundsummercamp.org At Camp Southern Ground we believe in helping to grow more good into the world. We also know that families all across America want their kids to grow into good people. Yet today with our kids stuck behind screens, being bullied in schools, or just struggling to fit in and be themselves – goodness can seem hard to find! Camp Southern Ground wants to be the place where your child can have good fun, eat good food, connect with good friends, and learn the confidence to go put more good into the world. During summer, Camp Southern Ground hosts campers for weeklong residential camps. As an inclusive camp, we serve children ages 7-17, from all socioeconomic backgrounds, races and religions, with programs that challenge, educate, and inspire. stability, postural control, fine motor skills, visual perceptual skills, and eye-hand coordination. The entire camp is designed and taught by a pediatric occupational therapist and mother who is dedicated to supporting children’s development and confidence. • BEAR WALKERS (prek-k skill level/ages 4-6) Best for children experiencing fine motor and visual motor difficulties in relation to drawing, coloring, and holding crayons and writing utensils appropriately. Max 4-5 children. • 8 sessions Tuesday-Friday, June 11-21, 2019 • 9:30am-12:00pm • CRAB WALKERS (1st grade Skill level/ages 5-7) This camp will focus on correct letter formation, sizing of letters, spacing, alignment of letters, and eliminating letter reversals. Additional activities targeting your child’s fine motor skills, strength, grasp, and motor coordination are included. Max 5 children. • 8 sessions Tuesday-Friday, June 11-21, 2019 • 1:00pm-3:30pm Both camps are $400. Included in each camp Tuition: Handwriting Without Tears workbook; Mini Fine Motor Box with select individual activities for at-home practice; Assessment results from screening performed on the first and last days. For additional information or to register, please contact Sara Shue, OTD, OTR/L, at playsatOT@gmail.com. er snack and extra jump time. • Only 40 spots are available for each week, so register today! • Register on our website or in store. If you have any additional questions, please email us at info@rushathens.com. Prince Avenue Christian School princeave.org Join the fun this summer at Prince Avenue Christian School where we learn to work and play The Wolverine Way... by honoring God, pursuing excellence and discipling students! We offer various sports and fine arts camps for rising Kindergarteners through 12th grade and adult. • Visit http://www.princeave. org/campus-life/summer atprince for more details and to register. Athens YMCA Camp Kelley 706-543-6596 office@athensymca.org athensymca.org Is your child ready for the best summer ever? Camp Kelley is the longest running day camp in our area and we are proud to say that camp has served many generations over the past 83 years. We are excited to offer your child an unforgettable summer experience. We have carefully designed our camp to provide age appropriate activities that are sure to help your child(ren) develop both mentally and physically. Join us for an amazing summer! 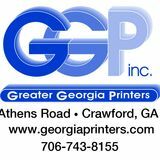 Send your photos and info to facebook at Athens-Oconee Parent Magazine. Kids love to see their picture, and you’ll love the keepsake!